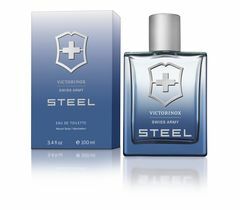 Refreshingly authentic, as magnetic and powerful as steel: Steel, the new Victorinox fragrance for men. Crystal-clear aqua notes, aromatic notes of viola and lavender underpinned by hints of earthy cedarwood, presented in a clean, square flacon – an aesthetic statement and a subtle promise that evokes confidence yet discretion, distilled to its purest essence. You can add multiple e-mail adresses as recipient. Just separate them by a comma. There was an error while trying to send your message. Please try again.